As part of this week's tour across Asia, Apple Chief Executive Tim Cook met with Japanese Prime Minister Shinzo Abe on Friday, and revealed details about a new research and development center set to open there soon. Via the office of the Prime Minister of Japan. Cook said Apple plans to complete construction of its new R&D facility in Yokohama, near Tokyo, this December, according to Xinhua. The comments suggest the facility could open earlier than expected, as reports from earlier this year suggested the Yokohama facility wouldn't be completed until March of 2017. "We talked about the future and doing great things together. 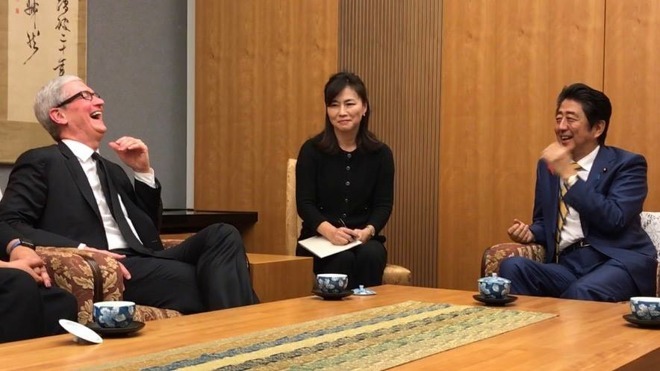 I shared with prime minister Abe our love for Japan and how important the country is to Apple," Cook said after meeting Japan's prime minister. Cook said he hopes that the new R&D facility will allow Apple to forge partnerships with local companies, potentially sourcing components for future Apple products. He said that the investment in Japan signals that Apple has more interest in the country than just selling products to Japanese consumers. Apple originally paid to take over part of a former Panasonic factory in Tsunashima-higashi, a space that measures over 269,000 square feet. As with a number of other Apple facilities, the company is working to "green" the complex by minimizing energy consumption. It will also make use of recycled water, and trees should be planted on the roof. Apple is also expected to tap into local talent specializing in materials science, vehicles and health industries.